Shigeo Igarashi was an American National Guard soldier before the war started, but because of his Japanese heritage he was stripped of his weapon and military duties. But Igarashi was prove how much he loved his country by sacrificing his life on the battlefields of Europe. Shigeo Igarashi was born on April 6, 1912 at Waialua in the Hawaiian Islands. He was educated at Waipahu Elementary School, Oahu where he excelled at baseball. He worked as a skilled laborer at Oahu Sugar Company and was a member of the Hawaiian National Guard. On December 12, 1940, the Hawaiian National Guard was called into federal service and Igarashi initially served with the 298th Infantry Regiment at Schofield Barracks. Like many people in Hawaii, he was Nisei - second-generation Japanese, and on December 7, 1941, when the Japanese attacked the US fleet at Pearl Harbor, everything changed. Americans of Japanese ancestry in Hawaii were treated with suspicion and those in military service found their duties suddenly reduced to menial tasks. Eventually, the 100th Battalion was formed, a fighting unit made up entirely of second-generation Japanese. 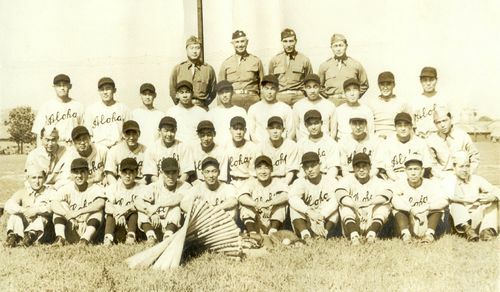 Igarashi took basic training with the 100th at Camp McCoy, Wisconsin, and quickly became a part of the 100th "Aloha" baseball team. The Aloha team initially played against the military police unit at Camp McCoy but soon found competition in nearby towns. In February 1943, the 100th Battalion moved to Camp Shelby, Mississippi for advanced unit training where the Aloha team continued to play. Private First Class Igarashi died of wounds received in combat on December 3, 1943 near Castelnuovo in Italy. He is buried at the National Memorial Cemetery of the Pacific in Hawaii. Thanks to Kerry Yo Nakagawa of the Nisei Baseball Research Project and Hawaii State Library for help with this biography. Photo of 100th Battalion team courtesy of Sons and Daughters of the 100th Infantry Battalion Archives.